Album of classical music by Russian National Orchestra founder is "extraordinary" say selectors. The BBC Music Magazine has nominated leading Russian pianist Mikhail Pletnev for its annual awards for the best sound recordings. 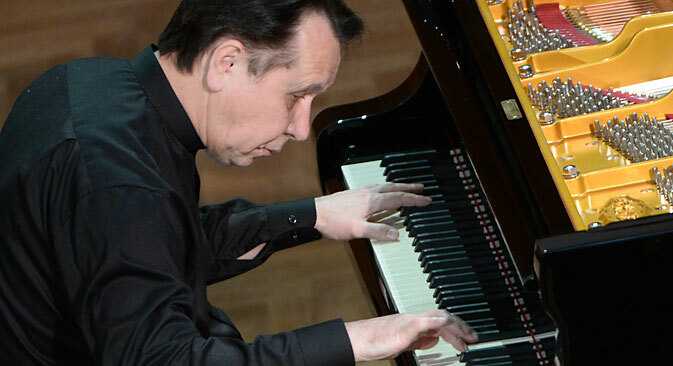 Pletnev is among those selected in the instrumental category, nominated for his solo album of music by Beethoven, Bach, Schubert and Chopin, Mikhail Pletnev in Person. Listen to our audio podcast and Balalike it! The selection jury noted that Pletnev, the founder and director of the Russian National Orchestra, was nominated for an "extraordinary" album. "This is no standard recital from Mikhail Pletnev. The Russian pianist is caught here warming-up, as it were, playing pieces through and trying out the piano in preparation for recording sessions. The results are extraordinary, as Pletnev brings a highly personal approach to unofficial performances that are now released with his authorisation," selectors said. Winners are chosen by readers and BBC listeners who vote for performers via the magazine's website. In 2011, Russian conductor Valery Gergiev's recording, together with the London Symphony Orchestra, of Sergei Prokofiev's ballet Romeo and Juliet, was named Disc of the Year in the awards.